Monsters and Critics: USA Network is always at the vanguard of social issues, and celebrating cutting edge artists in mixed media, whether it is photographs, film, television or written word. Plus, they have the most entertaining smallscreen series, such as "Burn Notice," "Royal Pains," "White Collar" and "Psych" that continually draw audiences to the ensemble casts that knock it out of the park every week. Many notable USA fan favorites are stepping up to the plate to voice their support for a return to civility and manners in the country, to put the brakes on unchecked bullying and intimidation. 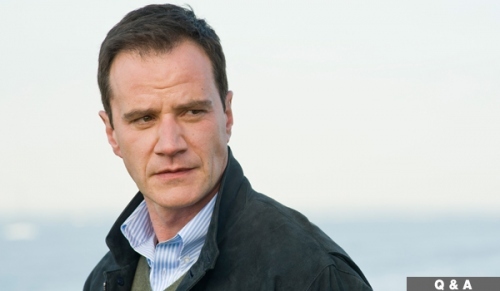 Tim DeKay took the pledge: “As a character of the USA, I pledge to stand against intolerance, prejudice, discrimination and hate, and to promote greater understanding and acceptance. I believe life is richer and we are stronger as a country when we see beyond stereotypes and appreciate each other for the characters we are. After all, characters are what makes us, USA.” (Take the pledge: Anti Bullying PSA with USA star Tim DeKay, video). Timothy Robert DeKay (born June 12, 1963) is an American character actor. His first on screen acting job was as corporate giant Larry Deon on seaQuest 2032. He was a cast member of the series Party of Five from 1997–1999, Carnivàle from 2003–2005 and Tell Me You Love Me in 2007. He has also guest–starred on a number of top-rated television series, including Seinfeld, Friends, CSI, My Name Is Earl, NCIS, and Scrubs. DeKay is currently starring in the USA Network series White Collar, which chronicles the partnership between a con artist (played by Matthew Bomer) and an FBI agent (DeKay). In 2009, DeKay was both director and producer of the short film This Monday. He also had a hand in shaping the scripted story. The film has been included in at least half a dozen short film festivals, including Cannes Short Film Corner. Reviews have been favorable, like this one from the Palm Springs International Short Film Festival (ShortFest): “Absolutely the Best of the Palm Springs Short Film Fest 2009, ‘This Monday’ features tone-perfect directing by Tim DeKay and screen-writing by Michael Santorico. Four Stars(out of Four) (Wikipedia).